Has anyone taken note of the recent proliferation of novels written in the genre of post-apocalyptic fiction? Apparently, the U.S. government has. On October 13, 2016, President Barrack Obama issued an executive order aimed at preparing the nation’s infrastructure for space weather events that could potentially wreak havoc on society as a whole. But what are space weather events? Space weather events are normally thought to include solar flares, solar energetic particles and geomagnetic disturbances to mention a few. These space weather events according to NASA and echoed in President Obama’s recent executive order occur regularly with some measureable effects on critical infrastructure systems and technologies, such as global positioning systems (GPS), satellite operations and communications, aviation, and the electrical power grid. Extreme space weather events – those that could significantly degrade or entirely destroy critical infrastructure – could disable large portions of the electrical power grid resulting in cascading failures that would affect key services such as water and food supply, healthcare, transportation and even the financial system. As noted in President Obama’s October 13, 2016 executive order, the key to staving off the effects of extreme space weather events would be the state of national preparedness for such events. In this regard, the recent executive order indicates that successfully preparing for space weather events is an all-of-nation endeavor that requires partnership across governments, emergency managers, academia, the media, the insurance industry, non-profits and the private sector. But has the insurance industry given much thought to preparing for potentially societal disrupting events such as these? The quick and unfortunate answer appears to be NO. 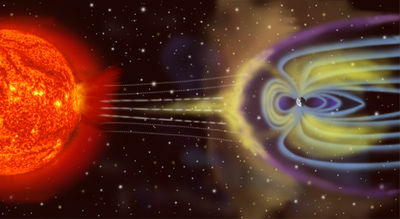 If the insurance industry had given any thought to preparedness for such space weather events, they would now be including such space weather events in their general policy exclusions and treating them much like the exclusions for “hostile or warlike action” or “nuclear reaction, nuclear radiation or radioactive contamination.” In most instances, property insurance policies specifically and unequivocally exclude loss, damage or expense caused by or resulting from these perils regardless of any other cause or event that contributes currently or in any sequence to such loss or damage. The obvious question is why should the insurance industry treat “space weather events” with such absolute exclusion status? Well … because nothing is immune from such a space weather event. First and foremost, due to the interdependencies of modern society, the insurance industry could face potential claims across all sectors of society including power generation, transportation, financial services, agricultural, communications and the list goes on and on. Source: Department of Homeland Security, National Infrastructure Protection Plan. Additionally, the potential loss or damage from space weather events could range from no physical loss or damage to complete societal breakdown. So, the only logical way for the insurance industry to prepare is to exclude such space weather events from all aspects of insurance coverage. With that said, if no such all-encompassing exclusion is added to current insurance policies, what could the insurance industry anticipate and how would it respond to such an event? In a worst case scenario, no one need worry because life on Earth would cease to exist. In a less extreme example, such as a super solar flare or extreme geomagnetic storm, society would likely face a loss of the electric power grid for some unforeseen period of time. In this situation, there would likely be covered physical loss or damage to which most property insurance policies would respond. There is also the potential for such space weather events to produce an electromagnetic pulse (EMP), which could cause the loss of most unhardened electrical systems and components. Or, during a geomagnetic storm, induced ground currents could potentially melt copper windings of transformers, crippling the power grid. And, as you undoubtedly recall from the massive power outage on August 14, 2003, our national power grids are more vulnerable than people want to contemplate. 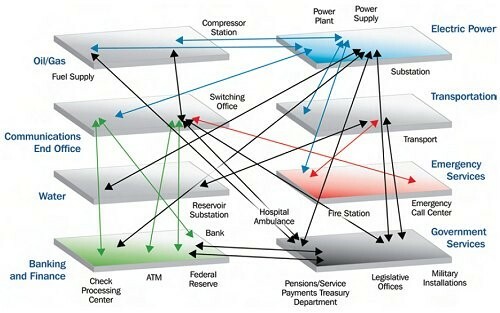 The loss of our national power grids, however, is only the tip of the iceberg. The loss of the power grid as result of a space weather event with resulting EMP effects could potentially devastate all sectors of society because of the interdependencies of modern social infrastructure. If the power grid was lost from EMP resulting from a space weather event, one could reasonably anticipate the almost immediate loss of transportation; fresh water; food and medicine with no means of transport for resupply; communications and an inability to produce or supply fuel. In such a situation, it is not difficult to foresee a complete collapse of the financial and monetary systems either. For example, an EMP from a space weather event could not only destroy the ability to electronically transfer funds, but also prevent access to electronic financial records. On a more personal level, people would not have access to funds through banks or ATMs, potentially leading to a collapse of the monetary system. Any local trade would likely be through barter or perhaps the new currency would be … ammunition! As these few examples demonstrate, the financial and social effect of a space weather event could be incalculable. But what if you wanted to make an insurance claim from such an event? The first thought that occurred to me was how … there is no electricity or operating financial system. Obviously, any response from the insurance industry would depend on the severity of such a space weather event and its resultant effects. The above examples may seem far-fetched but are simply used to illustrate the potential difficulties the insurance industry could face from a space weather event. Consequently, the insurance industry faces a host of problems in even considering President Obama’s call to arms in preparing the nation for space weather events. In a utopian world, the insurance industry could potentially assist in shouldering a portion of the burden of recovering from such a space weather event … but would the insurance industry exist afterwards? Who knows? However, in the real world, and in light of the potential broad spectrum impact on society from a space weather event, the insurance industry should use foresight instead of hindsight and begin excluding such space weather events for all facets of insurance coverage.